Bracha Sara Leeds sits down with a student at the University of California at Berkeley. Friday night: A time for family, a time for unity, a time for food, a time for 50 people to cram into a one-bedroom apartment … at least for Rabbi Gil and Bracha Sara Leeds of the Chabad Jewish Student Center at the University of California at Berkeley. Smack dab in the middle of the semester – which can be a time of decreased attendance for many campus-based Chabad Houses – the Berkeley center recently had a record turnout. Beds were pushed up against the wall, living room furniture became bedroom furniture. All this, and it was the week of the Cal-UCLA football game. "It wasn't anything special, just a Shabbat in the middle of midterms," said Gil Leeds. "Every Friday night we'll get an average of 30-40 students, so we've had to open up the sliding door between our room and our living room. "But that Shabbos, every single chair was taken, the couch was taken," he continued. "I didn't sit down; my wife didn't sit down." Nutritional sciences fourth-year student Rachel Maghen attributed the spike in attendance to the warmth that emanates from that tiny apartment. "I absolutely love it," Maghen said of going to the Chabad House. "It makes me feel like I'm at home for Shabbat. The environment is so warm. It makes it feel really family-like." Added third-year English major Elodie Resseguie: "You just feel really welcome. You're part of the family. You play with their daughters. "And Bracha Leeds does a cooking class where you prepare food that will be served at Shabbat," she continued. "You really feel part of the process." And that's what brings them back, week after week. 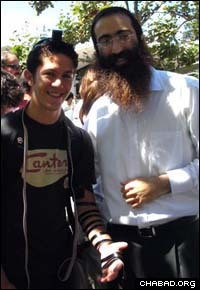 Jordan D'Amato dons tefillin with Rabbi Gil Leeds at the University of California at Berkeley. Out of some 34,000 undergraduate and graduate students at Berkeley, there are about 3,300 reported Jews, according to Bracha Sara Leeds. The actual number, she said, could be much higher. When the Leeds moved out to Berkeley earlier this year, they came with a wealth of experience about Jewish life on campus. It also helped that they are both Berkeley graduates. "We do have an advantage in that we know the area, many of the professors, the layout of campus and where everyone hangs out," she said shortly after the move. "We always wanted to give back. It was something we dreamed of, coming back to where we started from." Today, the Leeds offer classes in Jewish philosophy, the weekly Torah portion and gourmet kosher cooking, as well as one-on-one learning opportunities. In addition, Bracha Sara Leeds teaches classes on aerobics and relationships and intimacy for women only. Judging from students' comments, in a short time the Leeds have already made an impact. Despite a hectic schedule that also includes work as part of a residence-hall's staff, Maghen's made one thing clear to her employers: She won't work from Friday night to Saturday night. "The big separation is that Shabbat dinner is not an obligation," she clarified. "It's something we do because we enjoy learning, we enjoy celebrating and we enjoy surrounding ourselves with other Jewish people." So they sit and they eat and they talk. Intimate discussions about faith, relationships and life are commonplace at most Chabad Houses, but they take a different turn at Berkeley. For one thing, the campus is known for its heated debate. For another, the Leeds are young and open. "We have really good conversations," said Resseguie. "When we went on a Shabbaton, a bunch of us discussed issues of the times, [like] what makes food kosher. "They're a great resource for so many aspects of Judaism," she added. "And they graduated from Berkeley. We'll be talking about biology and Rebbetzin Bracha will remember the professor. They know the pressures of college life, the pressure of drinking and partying. It makes me feel more comfortable talking to them."